Students from Middlesex University's School of Art and Design are sparking international debate through the Urban Hive Archive, a research project into bees, sustainability and urban communities. The dwindling population of the world's bees and its potentially disastrous effect on our environment has inspired a fascinating collaborative project led by Middlesex students – and their approach is gaining momentum both locally and abroad. 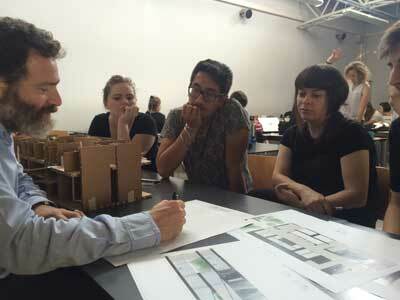 Associate Professor Judith Cowan, second year Fine Art students Jordan Tepper and Dean Jarvis and Graphic Design student Janice Larsen travelled to Italy recently to present the work of an art and design-led research group, the Urban Hive Archive, to staff and students of Urban Design at the Polytechnic University of Milan. A collaborative workshop, the brainchild of Milan-based curator Claudia Zanfi of GREEN ISLAND, allowed staff and students from both universities to share knowledge and exchange ideas about pressing urban issues related to ecology and sustainability through art and design practice. 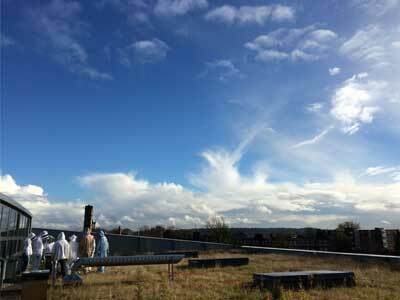 The Urban Hive Archive was launched in early 2014, with Middlesex students and Fine Art staff working with local Barnet Beekeepers to trace the movements of bees in hives located on Middlesex University's sedum rooftop. The hives, introduced through the interest of graduate student Lucia Stone and Associate Professor Simon Read, sparked a continuing debate. Now, the Urban Hive Archive group is exploring the bees' territories and the nature of green spaces around the Hendon campus, looking at the biodiversity of North London and how it is able to sustain a vital species that is often overlooked. Students are also involving the local community, asking the public to share their stories and engage with the project – raising further interest and emotional connection with the plight of the honeybees as they face the threat of extinction. "The more people we can get involved and fired up and passionate about this, the better we can do," says Dean Jarvis. 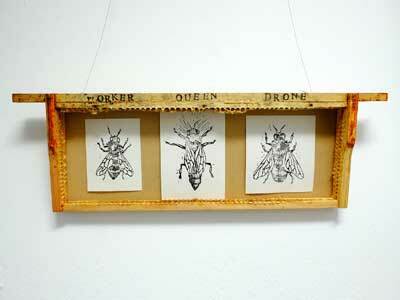 "Through the Urban Hive Archive project our students have developed a greater knowledge of the plight of bees and, through the project's connection with Claudia Zanfi's work, they have collaborated in unusual and inventive ways to create a more professional and public dialogue," said Judith Cowan. Investigating bee communities has also had a surprising impact on the way the Urban Hive Archive operates – as a truly diverse and multi-disciplinary group. "Because bees are communal insects, we have become quite communal in how we collaborate – we've had to discover unusual and inventive ways to create a more public and professional dialogue," says Judith. The international student debate is continuing and promises a newspaper publication and joint student exhibition in the future. GREEN ISLAND is continuing its Urban Hive programme and will create the first 'ART URBAN HIVE' in the EU. The Urban Hive Archive, 2015 students are Gabriel Dearnaley, Alyssa Dieterich, Dean Jarvis, Janice Larson, Lui Lewis, Joe Legget, Vladlens Spensers and Jordan Tepper. The Urban Hive Archive, 2015 staff are Associate Professor Judith Cowan, Associate Professor Simon Read, Kerri Jefferis and Alberto Duman. See our coverage in the Italian press.